so I took them to the extreme with some glitter and tape! They turned out so fun, sparkly, and one-of-a-kind! Here's how you can get the look in just a few minutes! 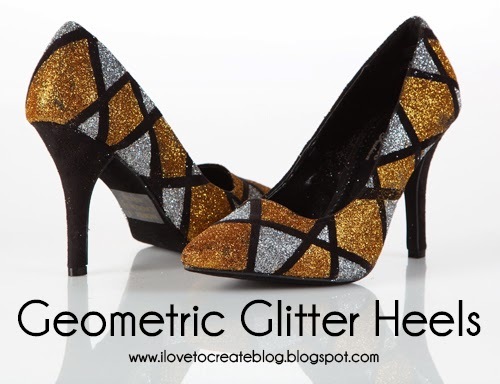 First rip off long pieces of tape and criss-cross them all over your shoe, creating lots of fun geometric shapes! Press securely in place. Next, use a paintbrush to dab on the Tulip Fashion Glitter Bond, doing one section at a time. Now sprinkle the glitter over the glitter fashion bond you just applied. Repeat this process on each section of the shoe, alternating glitter colors from gold to silver as you go. Rip off the tape when you are finished covering the entire shoe! Now you have your own sparkly and glam pair of shoes to wear for a fun night out! No one is going to have as cool a pair of shoes as this at the party...I promise! I want this for my shoes!!! they are beautiful! !